This page covers Trench MOSFET basics and mentions Trench MOSFET construction. The links to MOSFET and comparison between MOSFET and other transistor types are also mentioned. 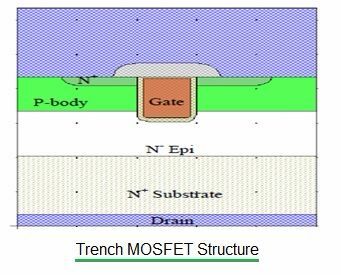 The device trench gate MOSFET has lowest ON state resistance among all the variants of MOS devices. Hence it is considered as most suitable power device for low to medium voltage power applications. The architecture is designed such that it conducts the current vertically from one surface to the other surface. Due to this the trench MOSFET achieves high drive capability. It is realized by packing millions of trenches on a chip, deep enough to cross the oppositely doped "body" region below the top surface. Each trench houses a gate dielectric and gate electrode to control the current conduction in its vicinity by the virtue of field effect. Similar to any other MOSFET, a trench MOSFET cell contains the drain, gate, source, body and the channel regions but exhibits a vertical direction of current flow. All the cells are connected to work in parallel in order to reduce the value of RON. 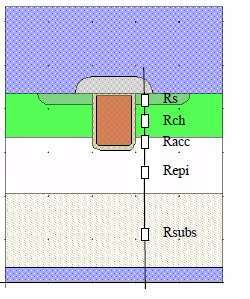 Figure depicts basic device structure for trench MOSFET. Trench MOSFETs are mainly used for less than 200 voltage rating due to their higher channel density and thus lower on-resistance. The amount of current trench MOSFET conducts depends on the on-resistance of the MOSFET which is expressed as follows. • REPI: resistance from the top layer of silicon (epitaxial silicon, also known as epi); epi controls the amount of blocking voltage the MOSFET can sustain.